The madness started a long time ago, 16 years to be exact. I remember exactly where I was when the madness started. I was 13 years old, and it was spring break 2001 in Memphis, TN. Ahh yes, that’s where the madness started, and tonight it will come to an end. It’s a very unique opportunity to watch the NCAA tournament live. As a 13 year old kid you dream of getting to watch the tournament from a seat, and not your couch. During the 2001 tournament I got that chance. That fateful week my family was back home in Arkansas for the break visiting my grandparents in Jonesboro. Memphis was a host site for part of the south region that year and sits just one hour from Jonesboro. This was (as much as I hate to admit my age) long before the FedEx forum, this was The Pyramid, and if you love upsets, this was your day. My family and I watched 2 games that day in Memphis, (4)Oklahoma vs. (13)Indiana St. and (5)Virginia vs. (12)Gonzaga. Being an Arkansas Razorback fan I didn’t have a dog in the fight except for a small scrappy team from Washington state. Just the year before, in 2000, I had filled out my very first bracket. That was back in the days when you bought a newspaper just to get the centerfold bracket out. One newspaper, one bracket, the good old days! 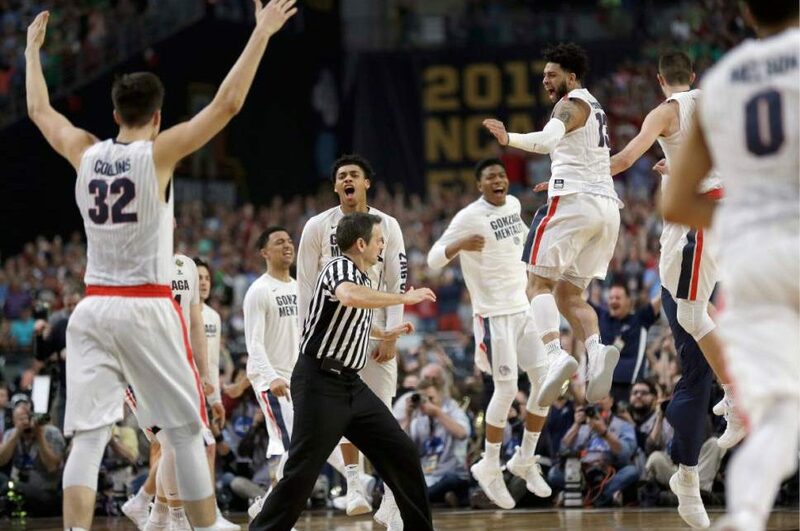 I remember vivedly watching the zags under brand new head coach Mark Few shock the world and go to the Sweet 16 and I was hooked on the Bulldogs. Now, here I was a year later watching that same Cinderella dance right before my eyes. Oh how she danced! The upset of Oklahoma by Indiana St. was only an appetizer for the main course. The Zags played kneck and kneck with a quality Virgina team, eventually squeaking out an 86-85 victory and yet another first round upset. From that point on I was all in on Gonzaga Basketball. I have watched as this program has grown from Cinderella at the dance, to the queen of the castle. Gonzaga is as competitive on a regular basis as they come. Many great players have walked the halls at Gonzaga over the years. This is a program that has risen to the ranks of the greats before our very eyes. When Mark Few was given the chance to coach at Oregon, he was offended by Oregon officials who told him that if he coached the Ducks, he would have a “real” chance for a title. It seems the Ducks may be eating crow tonight. Mark Few and the Zags now have that real chance. I love the way they have grown, and the way that Few has stayed loyal to the process of building his program. It has been a long road I know, but they have made it to the pinnacle, and now have a chance to cut down the nets. Hollywood wants instant gratification in its films plots, so maybe this story is to long to tell. However, tonight could be happily ever after. Even in a year when they have been dominant, a year when they are a one seed, a year when they should win it all. I find myself lost in the madness, I have grown up with Gonzaga and The bulldogs ARE march madness to me. From the moment I laid eyes on Cinderella in Memphis on a warm spring Thursday in 2001, I have dreamed of the day she would be the belle of the ball, the queen of the castle, and the last one standing. Tonight the madness stops! Tonight Gonzaga will take down the perineal powerhouse that is North Carolina! Tonight Cinderella will dance into the night and I will watch in wonderment the way I did all those years ago. All I have to say is GO ZAGS!